At the age of six, André Delpuch's gift for drawing was clear. His mother quickly recognized his talent and taught him all the fundamentals of painting. After an exhaustive education crowned with a scientific degree, he asserted the techniques of ink, pastel and chalk. After having diligently studied and carefully observed the old masters's greatest works at world-renowed museums, André was led to specialize in oil paintings over 35 years ago. When starting his studies at the Ecole des Beaux Arts, Paris, his teacher was impressed by the choice of André's patterns. The perfection of his drawings, and the chemistry of colors, led his teacher to confess he had nothing to teach André when saying, "the little you don't know, you will learn alone." In his career, his teacher never encountered such a talent. Meanwhile, André entered the Conservatory of Toulouse, where he was admitted as a light tenor. The combination of musical lyricism and attention to detail in his paintings express André's passion for perfection, full of sincerity and perseverance, as did the great Flemish, Dutch and German masters. André Delpuch met with the famous painter Pierre Laurent Brenot who provided him with advice, encouragement, and the urgency to expose. That led André to be supported by Societe Generale for several exhibitions in Midi Pyrénées. 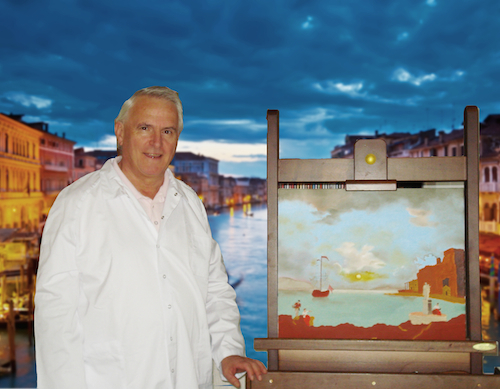 The artist was quickly spotted by eminent experts, including Christian Sorriano, who provided the official recognition in the professional world. In 2011, André presented his work at the Museum of Kobe, Japan. The same year, the Maison de France in Monaco awarded him the Academy Award of Merit, given by the President Jean-Paul de Bernis. In November 2013, members of the editing staff of the prestegious Benezit - Oxford Press in New York selected André to be included in the eponymous dictionary. This reference now increases his notoriety internationally. Since then, André Delpuch collects bronze, silver and gold medals at every presentation of his works. Private collections include locations in France, Italy, Spain, England, Belgium, Greece, Argentina and the United States.